Successfully Added SOLLED 2 Packed 1M 60LEDs TV LED Strip Light USB Port SMD 5050 Black PCB RGB Color Changing Light Kit to your Shopping Cart. SUPER BRIGHT 60 PCS SMD 5050: Adopts standard SMD 5050 LEDs which is much brighter than the SMD 3528 in the market. Total 60 LEDs, high intensity. EASY INSTALLATION: Flexible PCB board with adhesive tape on the back and 0.39in width allow you to install the light in tiny space. EASY OPERATION: Comes with a mini size controller on the end of the strip light. There are there buttons. Mode is for adjusting the dynamic lighting effect. Speed is for adjusting the light movement. Light is for adjusting the brightness. USB PORT: Powered by device with output 5V USB port, such as your computer/ desktop / laptop /tablet /car cigarette lighter/cell phone charger/adapter (5V). 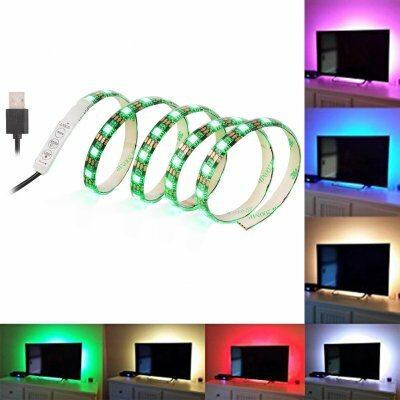 FOR HEALTHY LIFE: Alleviates eye-strain adds a subtle and comfortable light to your monitor, reducing the eyestrain caused by differences in picture brightness from scene to scene in movies, shows and games. Powered by USB: Plug and play. Easy plug into the TV back. Cuttable and linkable: Can be cut with scissors on the cut marks (white lines) to fit the desired size of your TV. Black PCB board: Make the light to be brighter. lighting and decoration solution for any occasion. Clean the dust before installation. Ensure the back of your TV is free from dust.